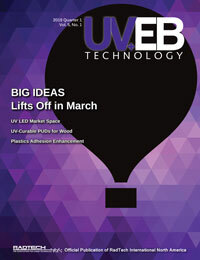 Editor’s Note: Energy curing technologies will play a significant role as manufacturers comply with global regulations. The authors perpective on future trends provides a look at what is on the horizon. How are global requirements for lightweighting and reduction of GHG emissions affecting automotive design? Industry-wide automotive initiatives have focused on multiple approaches to achieve a reduction in GHG. Lightweighting of the vehicle, as an example, is one approach to improve fuel economy by replacing steel, the primary material used, with suitable lightweight alternatives  such as high strength steel, aluminum, plastics and composites  in every phase of vehicle and part construction. Fuel economy improves approximately 6% to 8% by reducing vehicle weight 10%. Powertrain improvements to the standard combustion engine have dramatically improved fuel consumption over the last several years of development. Alternative powertrain development successes in hybrid and electric vehicles have made headway by becoming a viable approach for future vehicles, with some automakers announcing the elimination of the combustion engine in the next decade. And, autonomous vehicles have made substantial headway as the self-driving, computer on wheels version of the future vehicle, offering fuel economy with improved safety options. To deliver on reduced GHG emissions, the entire vehicle design and manufacture segment is advancing the use of new materials and new manufacturing methods. Most notably, vehicles are built with a multi-substrate mix (steel, plastic, aluminum, composite, etc.) that requires a different approach to material choice and assembly methods. New low-cure paint systems not only allow for the use of heat-sensitive plastics but greatly advance the GHG reduction in auto factories by reducing heat demands of high-bake ovens. Paint materials and process in the form of reduced cure Ecoat (corrosion layer), two-component 80°C cure paints or UV/EB cure paints, sealers and adhesives are approaches that are compatible with the goal of GHG reduction. In some cases, pre-painted parts are joined or built as part of the final assembly process, eliminating the need for assembly paint shops. New methods of bonding parts will increase the use of sealers and adhesives that minimize traditional welding and make vehicles quieter. Societal solutions are also at play, with vehicle ride-sharing that allows for reduced traffic congestion and improved emissions, particularly in global urban areas. New demands for these high-use vehicles are stimulating development of products with antimicrobial properties. Self-driving vehicles require additional cameras with lenses that are self-cleaning and paint that does not absorb IR light but is more reflective for light detection and ranging (LIDAR) sensors. Computer touchscreens, a mainstay in todays vehicles, need to be fingerprint proof to improve vision. Paint formulations are taking on a new set of design criteria to maximize the autonomous vehicle design. How has lightweighting changed substrate use in automotive manufacturing? Lightweighting is demanding that traditional industries  steel and aluminum  work very hard to find solutions to the MPG conundrum with lightweight offerings. On the other hand, the time is now for the plastics and composite market to make inroads. Steel still commands the lead in design, with approximately 35% of the vehicle weight, followed by aluminum at 12% and plastic derivatives at 10% to 12%. We have seen substantial movement in traditional exterior body panels to lighter weight plastics, as well as composites in vehicle design for bumper, hood and door panels. Carbon fiber is still too costly for low-cost/high-volume vehicle development, but with an excellent strength-to-weight ratio, it is being researched to improve cost and manufacturing volume capability for the automotive industry. Cost vs. performance continues to be the main driver in the decision to move from a traditional metallic to plastic/composite on the exterior of the vehicle. In many cases this has led to the multi-substrate approach for vehicle design, which takes the best substrate for each purpose into consideration for the total design. Lightweighting solutions are needed for glass in windshields, side glass and panoramic roof glass. Aerospace leads the way in the development of transparencies, and this research will be borrowed from as much as possible for automotive design. Material solutions under development include laminates of polycarbonate, acrylic and new, lightweight glass solutions. Interior parts  where parts are smaller and the need for strength and durability is not as demanding  are much more amenable to plastic solutions. The interior of the vehicle has adopted solutions throughout the cockpit, seating, flooring and door panels with innovative materials made from an array of plastics. Plastic design features include simulation of wood, unique graphics and glossy molded-in colors. In what ways is 3D printing being utilized in the automotive industry? What are the benefits, and where is the technology not ready for application? Automotive groups, along with many other industries, are studying the benefits of 3D printing and how the process can improve development time and in the future manufacturing of parts. Part development time can be greatly reduced with the ability to develop CAD parts and 3D print, cutting out the age-old, laborious process of developing a mold for each desired iteration of part. 3D printing is a breakthrough addition to the virtual world of manufacturing. 3D parts are functional for most automotive development studies but are lacking in real-world durability testing. As a result, a 3D-printed part can be used for fit and finish as well as the mold for a future part, greatly reducing development time. The long-term goal of manufacturing parts for a 200,000-per-year vehicle platform still requires materials that pass durability testing and 3D printers that are functional and cost efficient. Work continues in a very serious way, as automotive OEMs and suppliers look at the technique as a strategic method to bring products to market quickly. Long term, the strategic advantage to 3D printing might be allowing niche segments in the automotive market to be developed and produced in a cost-efficient way. What will the next evolution in the automotive industry be? Will consumer focus be targeted on electric vehicles? If so, what will that mean for the automotive OEMs? A global automotive market develops vehicle platforms that meet the criteria of the world marketplace. Customization of the vehicle does take place to meet regional requirements and needs. In most countries outside of the US, this calls for small vehicle platforms that meet city efficiencies in urban areas. In the US, a similar effect on vehicle platform has taken place but tends to favor medium-vehicle platforms, such as SUVs, due to affordable fuel and a suburban lifestyle (although this, too, is shifting). Energy consumption is a global concern, and with all the plans currently in place more is needed to meet the energy demands of the future. We have moved into a digital world in all respects; there is no turning back. These developments have greatly improved technologies, shifted business models and allowed for the growth of the global market. The future looks bright for new powertrains such as hybrid and EV, autonomous driving, efficient alternative fuels, energy-saving manufacturing methods and the expansion of the global automotive market  particularly in China, India and Africa, as the middle class grows in these areas. Mary Ellen Rosenberger (mrosenberger@bayspringsolutions.com) is founder and managing partner of BaySpring Solutions, LLC, where she focuses on supporting the international coatings industry in the areas of new product development, coating test protocol and resolution of coating field concerns. She has more than 35 years of experience in the field, including more than 20 years at PPG Industries and another 13 years with Ford Motor company. For more information, call 440.455.9323 or visit www.bayspringsolutions.com.